A week ago, if you'd ask me who my second-favorite DC superhero was (after Batman, of course), I probably would have said Superman without hesitation. However, after receiving the DCUC7 Flash in the mail, I suddenly remembered just how much I used to love the Flash. The Flash television show (1990-1991), starring John Wesley Shipp, came out shortly after the first Burton Batman movie - and it was great. It featured a kickass theme by Danny Elfman, an awesome costume designed by Dave Stevens (creator of The Rocketeer) and constructed by Stan Winston Studios, and episodes written by the likes of comics legend Howard Chaykin. 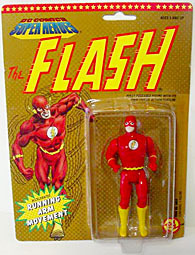 I had the ToyBiz DC Super Heroes Flash, and I distinctly remember an episode of the show where the Flash goes to the future and finds himself a hated outlaw, and a citizen gets in trouble with the police for having a Flash action figure - the same one I owned (though I suppose it could have been a Super Powers version, since they were all but identical). I was very fond of that action figure; its red-and-yellow paint scheme was very appealing, as were the treads on his boots, which were unusual for toys of the time [it was actually the ToyBiz Riddler figure who had the treads, since ToyBiz re-used Flash parts for the Riddler, for whatever reason --ed]. 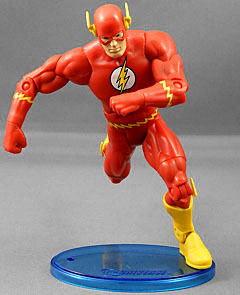 In a bit of serendipity, Mattel has produced this Barry Allen Flash just as the character returns to comics after a 20-year absence. Apparently his protege, Wally West, will be getting a new, modified costume that will be more distinct from Allen's classic outfit. As Barry Allen went about his business in the police crime lab, and electrical storm broke over Central City. Soon the lab exploded with a blinding bolt of lightning, bathing Barry in the supercharged fluids. This random combination of chemicals turned Barry into the fastest man alive! As The Flash, Allen vowed to use these powers to help humanity and guard Central City with high-velocity vigilance! I was slightly worried the DCU Classics Flash might feature the "large male" body used for other A-listers like Superman and Batman, but fortunately, Flash features the more slender body used for Green Lantern and Mister Miracle. The only newly-sculpted parts the head and boots, which have little wings on them - a characteristic of Barry's costume (as opposed to Wally's, which has no boot-wings). The wings are fairly sturdy, and I'm not concerned about them breaking off without effort. While the head sculpt doesn't require a lot of detail, it looks good. One thing that would have improved the figure would have been a flat, open hand - it makes for better running poses - but I'm just happy he has two closed fists and no open hands like the Hong Kong test shots had. Of course, the coolest part of the figure are the treads on the bottom of the feet. The Super Powers figure had them, so it's not surprising the Horsemen remembered this all-important detail for their version. We've been critical of the red plastic used in many previous DCUC figures, but the Flash seems to have come out better than many of them. With a less glossy finish than Shazam, the red looks and feels less like plastic, and a subtle wash on some parts (or perhaps a light airbrush spread? It's so subtle, I really can't tell) inhibits the translucent effect that sometimes troubles red-molded figures. The yellow trim on the belt and gauntlets is nice and clean, and the shade they used to contrast with the red is good. The tampo chest symbol also looks fantastic (though perhaps the black outlining is just a tad too thick). 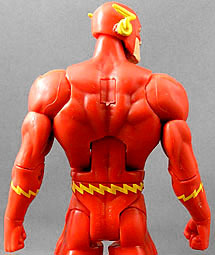 Flash gets the standard DCUC articulation: balljoints at the shoulders and neck, swivels at the biceps, waist, wrists and thighs, and hinges at the elbows, torso, knees and ankles, with some excellent side-to-side movement on the ankles as well. The legs are the usual H-hinge joint, allowing for balljoint-like articulation while minimizing interruption of the sculpt. The Flash comes with a blue display stand and that's it. No BAF part for this A-lister, which will be the way DCUC series work from now on. For once, though, I can't think of any good accessories that would have made sense. The Cosmic Treadmill would have been a bit too big, methinks. Mattel definitely appears to be improving their quality control, as I had no problems with my Flash at all - no incorrect limbs, no stuck joints, no sloppy paint. This is one of those reviews where my fondess for the character is definitely boosting the overall score. From a technical standpoint, this is probably a middle-of-the-line figure; but the Four Horsemen have given us the new gold standard in action figures of the Barry Allen Flash, and had he come with one flat hand, he would have been one of my favorite figures of the year.